I've been a bit blue....not sure why. It hasn't been the weather, that's for sure! October blessed us here in Central Kentucky with glorious fall days...warmish with just the right amount of slightly crisp air and lots of sunshine...what some call chamber of commerce days...until last Saturday when it turned cold, dark and rainy. Truth be told, I was in heaven. I LOVED it. I gave myself permission not to put on real clothes...turned on the lamps....lit a few fall'ish scented candles....cranked up the fireplace....put a pot of chili on....grabbed a big old furry throw and enthroned myself on the couch with a big pile of yarn and crochet hook. My intention was to try out this cute, vintage patterned potholder I found on-line. Easey, peasey, no stress whimsy. The colors and vintage motif really appealed to me and I need some new pot holders. But after I got a few rows of the blue yarn crocheted up, I began to think this was going to be a somewhat petite potholder. I am a bit clumsy around the kitchen and often in a hurry, so I try to use a generously sized potholder to keep me feeling safe...just in case I slip. 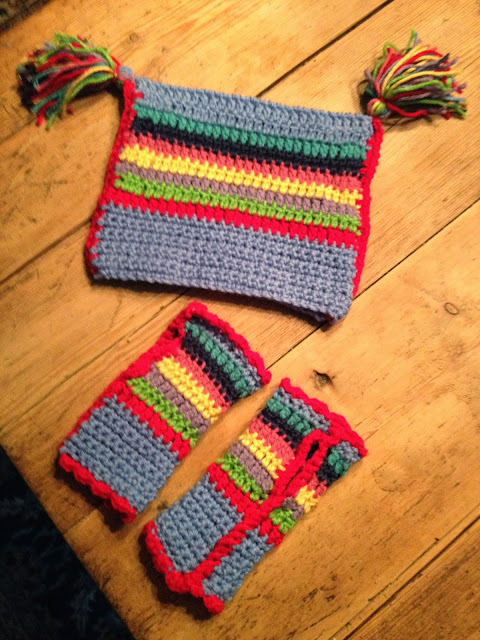 But I hated to give up what I had done and the colors were so much fun, I just crocheted on. Of course, little c was wandering about, doing her own creative, rainy day things....singing, dancing, drawing and writing, it changes minute to minute....she loves a pj day as much as her mama. She asked if I was making something for her...no, not this time. But then I remembered a cute, stripey pattern I had seen for fingerless mitts and I wondered if my too-small pot holder might be just the right size to wrap around c's little wrist. This is my inspiration photo from a wonderful, wonderful blog. I want to live in her world! So I set out to convert my ill-fated potholder into a mini version of these stripey mitts. I kept the little scalloped border, that really adds a nice finishing touch. The only change I made was to stitch the seam in a single crochet on the right side of the mitts...I'm TERRIBLE at sewing a seam. I saw this as an opportunity to make the seam a feature, rather than trying to hide it poorly. 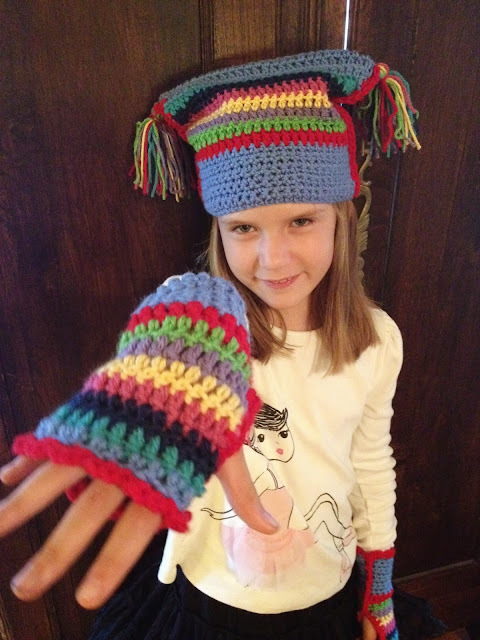 After I finished the mitts, she was so tickled with them, she asked me to make a matching hat! Using a squarish shaped hat I purchased for her last year as inspiration and to help gauge a good size, I figured out about what the width should be and I crocheted a rectangle in a matching stripey pattern and then just folded it in half, top to bottom. I used the same single crochet stitch to seam the sides and then I found a you tube video that showed how to make tassels to adorn the corners. 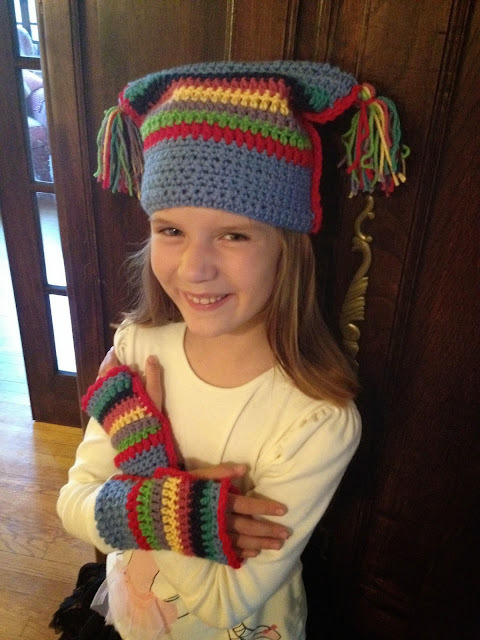 Voila....a hat and fingerless mitts....all from my ill fated pot holder attempt. Atticus the Cat was pretty happy with the laid back day too. 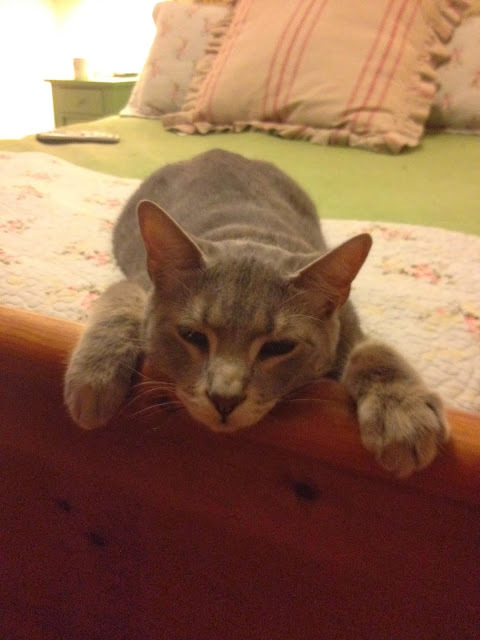 I think he was very tired here...just worn out, after hours of trying to sneak my ball of yarn away from me. c insisted on wearing her ensemble to school on Monday, even though it had warmed up by then. She said that she wore them in class until her teacher had to ask her to take them off and that ALL her friends want a set of their own. Not bad, for a potholder. Here's to rainy, cold, grey, but still cozy sorts of fall days. And to stripey mitts with matching tassel hats, sweet little girls and aggravating, yarn thieving cats, all who chase the blues away. Want to receive In Clover by email? Click here to subscribe (it's free!) with no threat of spam.